Hair Breakage – The following outlines the main hair shaft defects present in human hair. Many can be avoided. This paper is not designed for self diagnosis. Professional advice should be sought in such cases of hair shaft deformity. Idiopathic Trichoclasia – a rare condition that presents as oval patches of varying size at the vertex or anterior parietals. Microscopic examination shows broken hairshafts with brush likeends similar to trichorrhexis nodosa but with a maximum length of 6 mm. The surrounding skin may be normal or lichenified. Idiopathic Trichoclasia shows no affiliation to age, ethnicityor gender. Recurrence is possible. Excessive massage or scratching is a suggested cause. Monilethrix (beaded hair) – hair-shafts exhibit swellings or nodes with intervening constrictions. Tends to affect children. 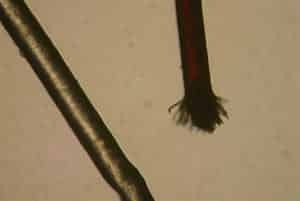 Hairshafts are fragile and breakage is common. Keratosisis in presenton bald areas. Tends to affect other family members. It may disappear after puberty. Trichokinesis (twisted or corkscrew hair) syn. Pili Torti. – the hair-shaft twists at regular intervals throughout its length presenting a shimmering appearance due to the effects of light. Tends to affect blonde females born without hair. The scalp is often dry and scaly. Eyebrows and eyelashes may also be affected. The condition may improve as hairshafts strengthen with age or after puberty. Confusion with monilethrix may exist. Trichokryptomania – a condition in which hairs are broken off (self induced) by twisting. Often seen in neurotic patients. Appearance is usually symmetrical. Tends to affect the parietal and auricular regions of scalp. Broken hairs are of differing lengths. Short hairs are present. Trichonodosis (knotted hair) – hairshafts grow in loops and sometimes form knots. Breakage follows through self manipulation e.g. combing & washing etc. Hat wearing, pillow contact and the use of head rests or hats may be inculcated. The lower occipital region tends to be more frequently affected. Trichoptilosis syn. Fragilitas Crinium – hairshafts become dry exhibiting longitudinal cracks (splits ends). These splits can flay – reminiscent of feathers. Caused by age or chemical processing. Trichorrhexis Nodosa – a swelling appears on hairs-hafts. Breakage occurs leaving the ends frayed (almost brush like). The condition can result from: excessive heat, exposure to hydrogen peroxide, hair dyes, alkalis, mechanical traumatism. Hairdressing procedures – capable of causing hair-shaft damage /destruction include: Bleaching, Highlighting, Tinting, Permanent waving, Hair relaxing, Hair extensions, Rapid blow drying, Application of braids, corn rows or plaits.